Mutual gazing by dogs but not wolves increases oxytocin levels in humans. For many people dogs are considered to be family members and their best friends. Indeed, because of the long period of close association between dogs and humans, a deep bond has evolved (for numerous references and discussion please click here). While the existence of this co-evolved and special bond is a given, researchers have also been interested in what might mediate this close connection and if a similar relationship exists between wolves, from whom dogs have emerged, and humans. And now, some important light has been shed on these questions. A paper published this week by Miho Nagasawa and his colleagues titled "Oxytocin-gaze positive loop and the coevolution of human-dog bonds" in the prestigious journal Science shows that indeed, there is something unique about human-dog bonds. The summary and conclusions of their essay, available now online, read as follows. 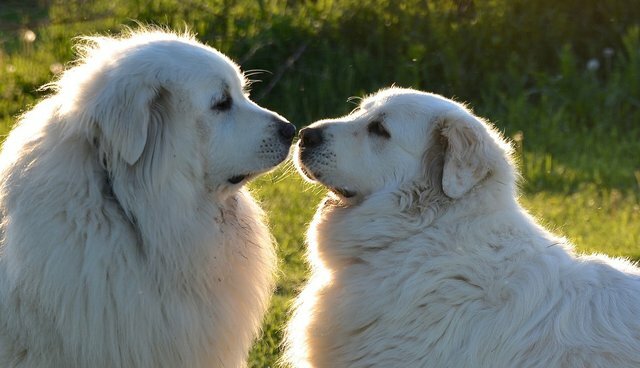 Human-like modes of communication, including mutual gaze, in dogs may have been acquired during domestication with humans. We show that gazing behavior from dogs, but not wolves, increased urinary oxytocin concentrations in owners, which consequently facilitated owners' affiliation and increased oxytocin concentration in dogs. Further, nasally administered oxytocin increased gazing behavior in dogs, which in turn increased urinary oxytocin concentrations in owners. These findings support the existence of an interspecies oxytocin-mediated positive loop facilitated and modulated by gazing, which may have supported the coevolution of human-dog bonding by engaging common modes of communicating social attachment. In the present study, urinary oxytocin concentrations in owners and dogs were affected by the dog's gaze and the duration of dog-touching. In contrast, mutual gaze between hand-raised wolves and their owners was not detected, nor was there an increase of urinary oxytocin in either wolves or their owners after a 30-minute experimental interaction (experiment 1). Moreover, the nasal administration of oxytocin increased the total amount of time that female dogs gazed at their owners and, in turn, urinary oxytocin concentrations in owners (experiment 2) ... These results support the existence of a self-perpetuating oxytocin-mediated positive loop in human-dog relationships that is similar to that of human mother-infant relations. Human-dog interaction by dogs' human-like gazing behavior brought on social rewarding effects due to oxytocin release in both humans and dogs and followed the deepening of mutual relationships, which led to interspecies bonding. This landmark study by Dr. Miho Nagasawa and his colleagues helps to explain how dogs became an intimate part of our own history. And, while oxytocin is indeed important for human-dog bonding and for dogs paying close attention to us (see "The Bond Between Dogs And Humans May Boil Down To One Amazing Molecule"), it's important to remember that, according to experts such as Paul Zak, a professor of neurology at Loma Linda University in California, oxytocin "is one of the many signals in the brain that motivates social behaviors ... [and] the brain is much more complicated than one chemical." Previously I've also cautioned about over-playing the singular role of what I call the "big O" - oxytocin - and noted perhaps we will soon see "Big O" pills or sprays on the market. While there are practical difficulties in getting oxytocin into the brain, if it's profitable drug companies will find a way. Whether or not oxytocin turns out to be the only reason behind the strong, enduring, and reciprocal human-dog social bond, this research is incredibly important for learning more about dogs and us and lays the groundwork for future work in this fascinating area of anthrozoology. Indeed, some researchers question the uniqueness of the human-dog bond. I'm sure there will be much more to report in the near future. So, please stand by.